The 'Book and Build' feature on Harrier's microsite allows the user to first customise the Harrier and then book it. Ever since the first teaser of the Harrier saw the light of the day, Tata Motors has since launched an all-out campaign to popularise the Harrier through each and every possible means of digital communication. As part of its strongest digital marketing campaign to date, Tata has launched yet another digital feature for potential Harrier customers. 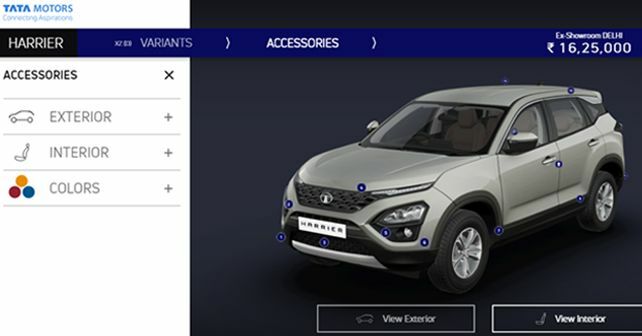 Thanks to the 'Book and Build' feature available on Harrier's microsite, users can save themselves a trip to the Tata dealership, for the online configurator, called the 'Imaginator', allows users to choose the desired variant of the Harrier (in the colour of their choice) and offers numerous interior and exterior accessory options to choose from, before they finally book the model. This offers a premium experience to users and lets them see a 'preview' of their configuration before finally placing the order for the car. The list of accessories (both functional and aesthetic) on offer is quite extensive, and the best part is that the entire arsenal of accessories is available for each variant. The list of exterior accessories includes garnishes for multiple body panels, chrome accents, DRLs with fog lamps, mud flaps, roof rails and door visors. The interior accessories are mostly comprised of floor mats for different areas of the carpet and interior mood lighting options (in multiple colours). While the accessory list might seem lucrative, users need to keep in mind that each accessory will add to the car's ex-showroom price, which can reach up to ₹ 1 lakh! Further, vehicles booked online won't be exempted from the Harrier's existing waiting period, which is around three months. Is this the first teaser of the Tata Hornbill Concept?